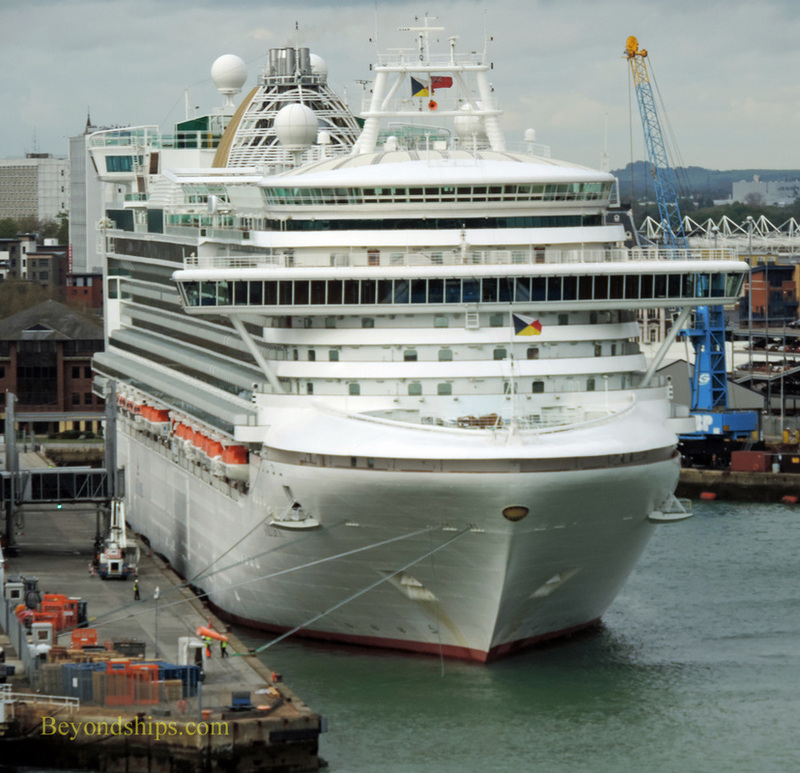 In the Spring of 2013, Southampton was the base of operations for three sister ships - - P&O Cruises' Azura and Ventura and Princess Cruises' Crown Princess. The three ships are Super-Grand class ships built by Fincantieri. This design can be traced back to Princess Cruises' Grand Princess of 1998. With Crown Princess (2006), the design was significantly modified including the addition of another deck and the relocation of the nightclub that was suspended over the stern on the earlier versions of the ship. Azura and Ventura are based on the Crown Princess' design although their interior layout and decor is somewhat different. 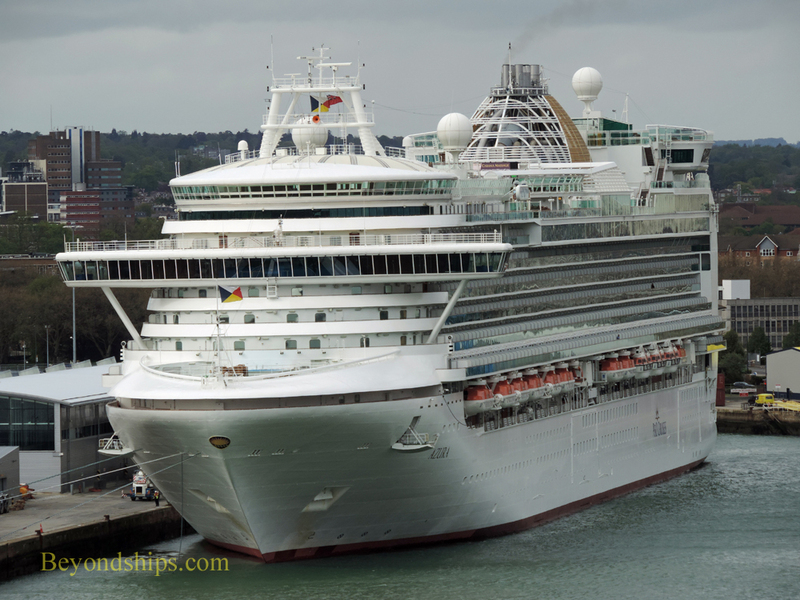 How did P&O Cruises come to have the same ship as Princess Cruises? 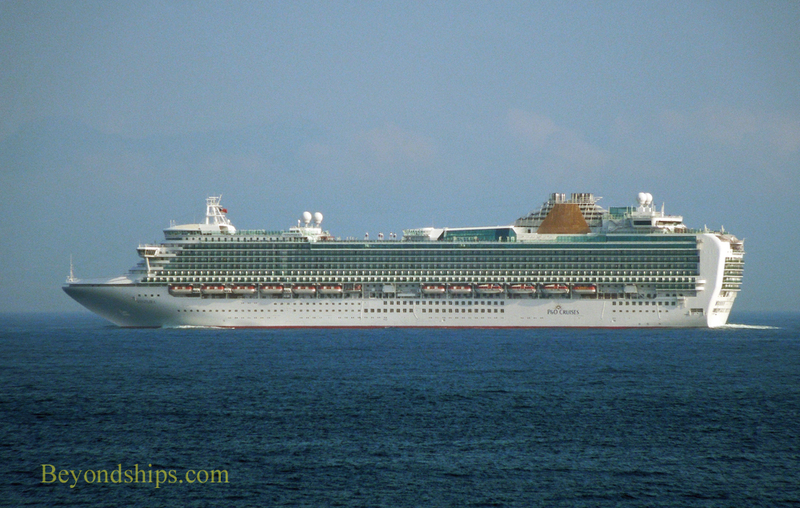 When Grand Princess entered service in 1998, Princess Cruises was owned by P&O Cruises. Subsequently, P&O planned to build a Grand class ship for itself and even ordered one for the British market. However, for business reasons it allocated all of the Grand class ships to its Princess subsidiary including the one that was ordered for P&O Cruises. (It became Caribbean Princess) After coming under the Carnival Corporation umbrella in 2003, conditions were such that a pair of Super-Grands could be built for P&O Cruises. Azura docked at Southampton's Ocean Terminal. A few days later, Ventura is at the Ocean Terminal. Ventura is slightly larger in gross tonnage than Azura largely due to the fact that she has an enclosed swimming pool. After leaving her berth, Ventura heads down Southampton Water. 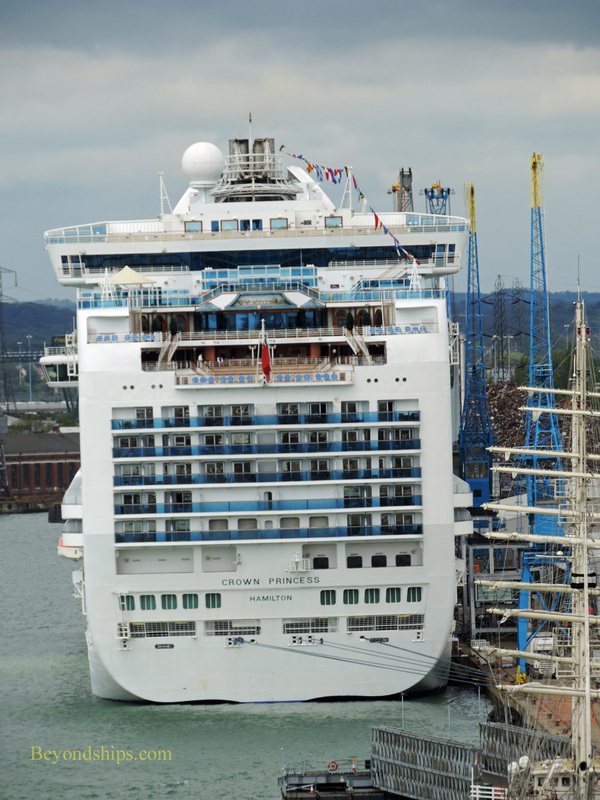 Right: Crown Princess docked at the Mayflower Cruise Terminal. In the slideshow below, we see her leaving the berth, entering the turning basin at the end of the harbor where she turned 180 degrees, sailing through and exiting the harbor.